The City of Milwaukee and local organizations implemented an initiative to address the future of the Historic King Drive and Bronzeville and Walker’s Point neighborhoods north and south of Downtown. The potential for new transit through these neighborhoods opened the opportunity to think about a range of housing, jobs, public realm and transportation directions for the future. This highly collaborative initiative was conducted with significant community engagement through local organizations, public workshops, multiple local meetings in each neighborhood and an on-line platform. 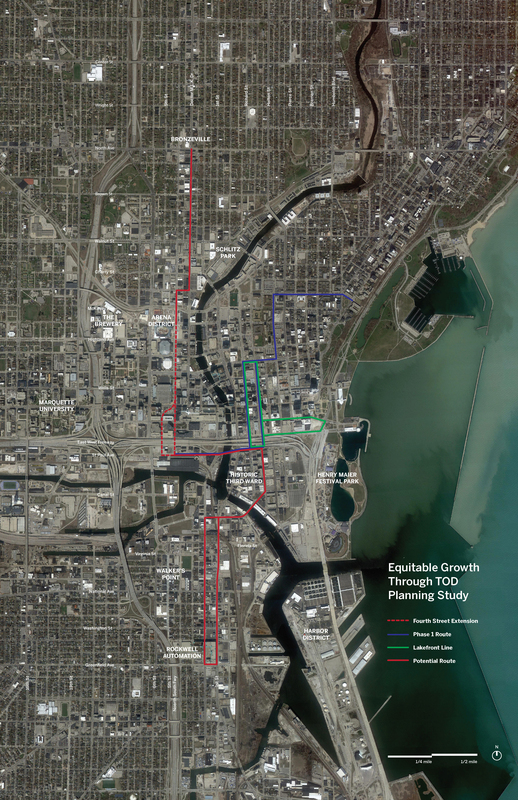 The Equitable Growth Planning Study was conducted to evaluate how to best leverage Transit-Oriented Development (TOD) to advance existing economic development efforts taking place on these corridors that are directly to the north (Bronzeville) and south (Walker’s Point) of Downtown. Better connecting these neighborhoods to the 81,000 jobs in Downtown will increase Streetcar ridership and provide ladders of opportunity for Near Northside and Near Southside residents. The planning project was geographically focused on the proposed King Drive and Walker’s Point Streetcar extension routes, recommendations of this study will also be used to help guide development along all of the City’s major transit corridors, whether Streetcar, BRT, or existing express bus routes. The study used an in-depth market analysis and extensive input from area residents, businesses, elected officials and other stakeholders to develop a set of goals and recommendations for how these neighborhoods can capitalize on improved public transit. The intention was to create options to attract new businesses and to provide expanded housing options, with transit as a driver. The study also developed affordability strategies aimed at minimizing the potential risk that future development pressures will displace existing residents and businesses. To view the final reports, please proceed to the resources section. How was this initiative funded? Funding for the study was provided through a grant from the Federal Transit Administration’s Pilot Program for Transit Oriented Development Planning Program. The Historic King Drive Business Improvement District and Harbor District Inc. partnered with the City of Milwaukee to apply for these funds and to lead the development of this Equitable Growth Planning Study. The Equitable TOD Planning Study formally launch in August of 2017 and concluded in October of 2018. There was a number of public meetings carried out in both study areas to help shape the recommendations of the study, as well as multiple other ways for the public to engage with the process online and at other neighborhood events. What did this initiative accomplish? Development plans and policies for key sites to determine market potential, desired density and intensity of development, and conceptual renderings. 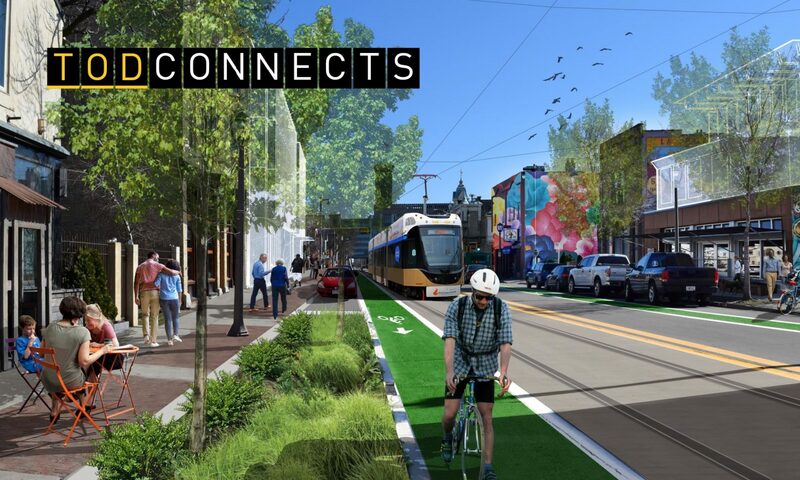 A connectivity plan that makes recommendations for streetscape improvements, wayfinding and gateway signage opportunities, bicycle and pedestrian connections, and other infrastructure improvements needed to increase ridership, connect the streetcar stations to the surrounding neighborhoods and break down barriers to equitable access. A housing market analysis including housing development strategies, with a focus on providing new affordable options within TOD, preserving existing affordable housing, and protecting the historic properties along the corridors. Were there partners on this project? MKEUnited shares an inclusive vision for Downtown Milwaukee and its adjacent neighborhoods and was our partner in this initiative. Creating better transit connections between downtown and the surrounding neighborhoods, ensuring a diverse mix of housing options, and supporting local business along neighborhood commercial corridors are all MKE United goals that were furthered through this study. The Halyard Park Association, Historic Brewers Hill Association, and Walker’s Point Association were also partners in the project and helped ensure that the input of residents adjacent to these transit corridors shapes the final recommendations. The Department of City Development hired Skidmore, Owings, and Merrill (SOM) to lead the development of this Equitable TOD Planning Study. SOM is a world-wide leader in Transit Oriented Development planning and urban design. HR&A Advisors also was hired to prepare the Market Analysis for each neighborhood and develop recommended affordability strategies aimed at minimizing displacement and preserving affordability. P3 Development Group, ABRAZO Marketing, and Lockly Valuation Services were among the local firms working as part of the consultant team. Several public events took place to gather community input. To view materials and recaps of what was presented at these meetings along with the final neighborhood plans, please visit our resources page.